Rolling Stones crag located right and above the Leonard cohen memorial buttress,starts just right of the access route to the top of the Leonard cohen Memorial buttress indicated by access rope. The lower part of the crag consist of a sweeping slab peppered with tiny ledges with a steep upper section with stack flakes. Approch as per Leonard Cohen Memorial Buttress continue arround to the access route to the top indicated by a insitue rope. Walk off and scamble down to the top of the insitue rope for Leonard Cohen Memoral buttress. start below the first crack-line at the left hand side of the Rolling Stones wall. in the gully. The route climbs the initial slab and then crack, moving right around the small overhang, then following the continuation crack to ledges. 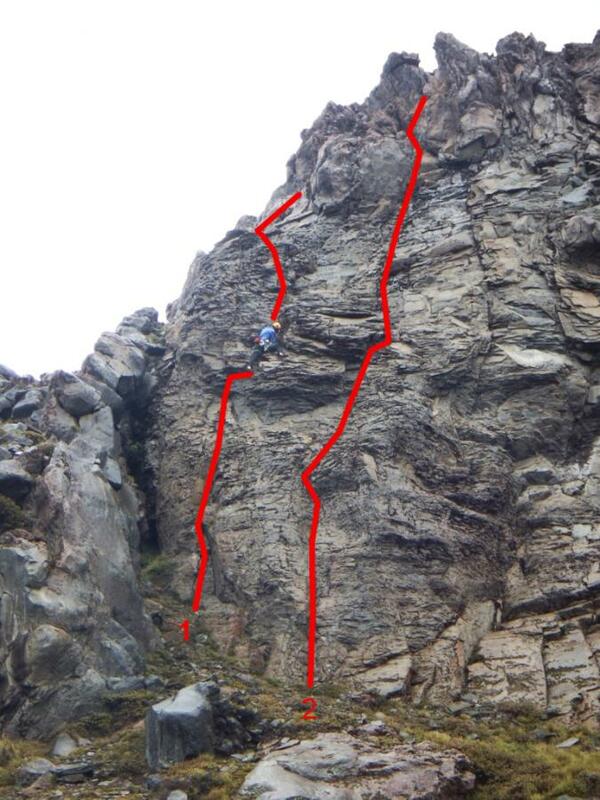 From here either continue straight up to belay at ridge or move slightly up and left to finish. Descent: scramble down to the access rope for LCMB and back to foot of climb. Beware of loose rock when topping out and arranging a belay. 2m right of Gimme Shelter, Follows the next obvious line of weakness. Good gear but spaced. Crux at top pulling through stacked flakes. Belay of large boulder.